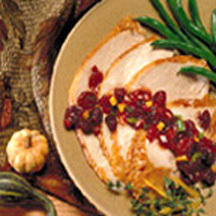 Seasoned with fresh thyme, this sweet and tangy cherry relish, with colorful bits of red onion, yellow and green bell pepper, is wonderful with roasted turkey, ham, pork or grilled hamburgers. Combine dried cherries, preserves and vinegar in a small microwave-safe bowl; mix well. Microwave on High (100% power) 1 to 1-1/2 minutes, or until hot. Let stand 5 minutes. Makes about 1 1/2 cups; enough for 6 to 8 servings with a main course.